Pyrgi is a medieval village on the island of Chios. It’s often called the Painted Village after the unique geometric designs, xystra, covering many buildings. This type of decoration is found nowhere else in the country. It may be of Italian origin, a cultural remnant of Genoese control of the island from the 14th to 16th centuries. Pyrgi is a fortified village, with narrow lanes and buildings connected to form impassable walls. 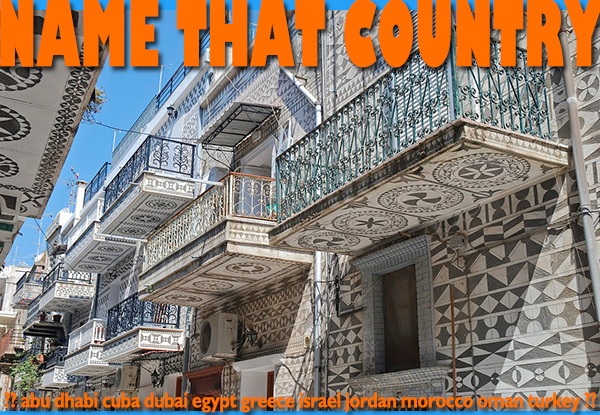 This entry was posted in Greece, name that country quiz and tagged chios, Greece, greece tours, pygi by yalla2013. Bookmark the permalink.